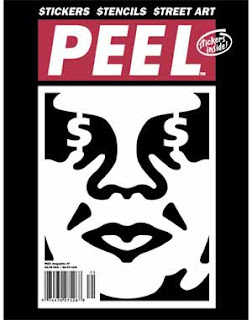 Some frineds of The Urban Shop who frequently send us US mags sent us a copy of Peel Magazine the other day and I've picked it up every day since. Issue 7 features and articel with Shepard Fairey (Obey) on Selling Out a great article I feel such and affinity with the guy, I have spken with his wife on occassions and he has very similar background interests to me. Also interviews with Ako, Bisc1, Dj Shiro, Gypsy Kid, Sticker Nation and Robots Will Kill to name a few some we know others we dont but it's a great read and packed with stickers, stencils and streetart and it's not stuck up a dark hole it just says it as it is.